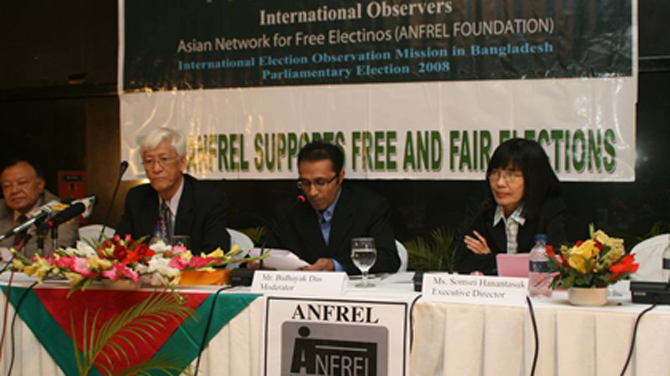 The Asian Network for Free Elections (ANFREL), a Bangkok-based organization that monitors elections in the region, said that its coordinator was deported from Burma on Tuesday. The move comes at the same time that the Burmese government invited the US, the EU and the Association of Southeast Asian Nations (Asean) to send observers to monitor the April 1 by-elections. Sources from ANFREL said that Somsri Hananuntasuk arrived back in Bangkok on Tuesday evening after Burmese immigration officials visited the Rangoon hotel in which she was staying and asked her to pack her belongings and leave the country. Somsri entered Burma on Mar. 15 in an attempt to win permission from the Union Election Commission in Naypyidaw to allow her organization to observe the upcoming election. It is, however, unclear whether she was asked to leave the country for her election-related activities in Rangoon, said the sources, adding that immigration officials told Somsri that she can return to Burma again, but not on a tourist visa. During her stay in Rangoon, Somsri attended a meeting with some local political party members where she was requested to share her experiences on the holding of free and fair elections. Somsri has been involved in election observation in more than 20 countries. Burma on Tuesday invited the Asean bloc to send a five-member election delegation along with over two dozen parliamentarians and media representatives. The invitation was extended on Wednesday to include the US and EU, which are dialogue partners of Asean, according to an Associated Press report quoting the US embassy in Burma. “We are encouraged that the authorities have invited international representatives as observers, including from Asean, the EU and the United States,” embassy spokeswoman Adrienne Nutzman told The Associated Press. The US and EU have singled out the April polls as a measure of whether the West will lift sanctions imposed on Burma. The April 1 by-election is being held to fill 48 parliamentary seats vacated by lawmakers who were appointed to the Cabinet and other posts. Burma’s pro-democracy icon Aung San Suu Kyi, who leads the main opposition National League for Democracy, is contesting a seat. our all nation and multi ethnic in Burma should be faithaganst for right & justic antil dead. that is only one way i thing no more to finding for reslove. we have to think about Indonesia-Iraq-Afghan-Egipt. why Burna leader and people careful to dea...? did you how becoming independent..??? Myanmar invites foreign observers to monitor the poll, but what is it? Seems the invitation is only lip service of junta. She was in Myanmar to ask accreditation for monitoring the poll, not to violate the rule. This is just a matter of Military government still intending to steal and cheat the votes. Not a matter of she violating Immigartion's laws. To obtain Bussiness Visa is much harder than Tourist Visa, have to pass through so many steps, not just easily fill up the form and get it. Meaning, Military Government don't like observers to observe the polling. By election is on April fool's day. Is it coiendence? We are shocked by the deportation news of The Asian Network for Free Elections (ANFREL), a Bangkok-based organization, Coordinator Somsri's deportation by Thien Sen's immigration. It's a big insult to freedom of press. The respected election monitor shold be allowed to monitor the by election. U Thein Seen needs to honor his promises before confirming his chair for ASEAN. Don't make the world fool. No doubt, unfair and unfree election going to be held in Burma. This is the will of Burma Government, dictatorship rule is still going. There is no ethnic rights. Only Maha Bama will rull the whole country. Perhaps she entered Myanmar on a tourist visa, 1 month stay, but then performed her organization activities. This is the breach of international protocol. She should have requested for official visa. There would be no free and fair election this by-election. Be warned. All cronies and business associates of the military have been roped in to form election lackies for the USDP to coerce for votes. So Burma then is still run by the military. If she took tourist visa, that definitely not related to what she is doing in Myanmar e.g. sharing her experiences on the holding of free and fair elections. She would have to apply for different type of visa. Sneaking in is not an option. With the fascist in control in Burma the problem is never how best to present the truth to the public but how best to use the news to deceive the public into giving the fascists more money or more power. Don't be suckered by these soldiers now wearing suits! Coming April 1st by election is a barometer for US and EU to lift sanction. In fact from now USDP party members already violated election laws, those who violated the laws should take action and give pernishment, then only rule of law will exist in Burma. Government is allowing Asean and it dialogue partners such as US and EU is also allow to moniter the 1st April election, it is very good starting so that monitering peoples will give clear picture whether it is free and fair or not.